You may have read the title of this post and thought, really, plumbing fixtures? What is inspirational about those? Plumbing fixtures aren't something most consider when they think of interior design and designing spaces. The type of fixtures and finishes you choose though can significantly affect the overall look and feel of your home. If you have never gone shopping for fixtures, you may not know that there are quite a few options available. There are a variety of styles, shapes, finishes, and ways to mount them. Here are a few plumbing fixture ideas for inspiration in the event you are currently on the hunt. The type of fixtures you choose should fit with the overall style of your home. 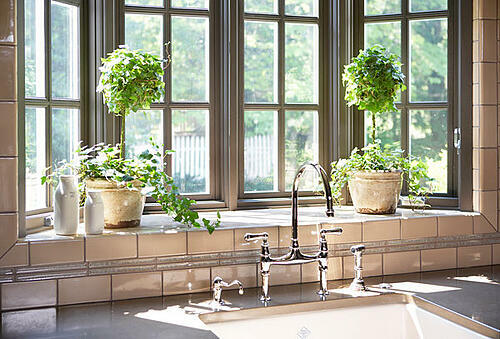 For a newer, more traditional home, simple yet ornate fixtures fit well. 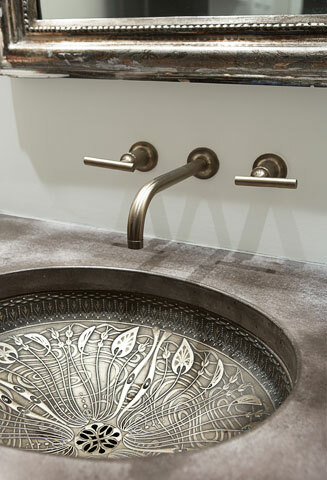 Fixtures also come in a variety of finishes like chrome, polished nickel, brushed nickel, brass, or oil rubbed bronze. The type of finish you choose is mainly a personal decision but should match the rest of the finishes used in your home. 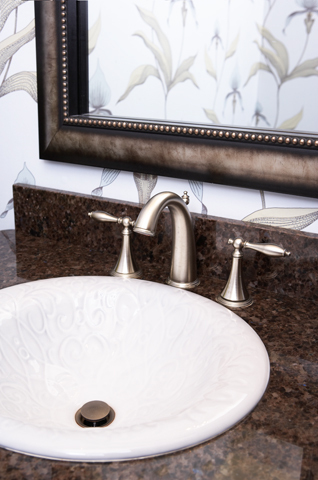 For a home with a more modern style, select fixtures with sleek and clean lines and less ornate detailing. When making selections, you also have the option to choose whether you want a centerset faucet, which will result in one hole, or a widespread faucet like the one pictured below. There are also a few options when it comes to mounting your fixtures. You can mount your fixture on your sink directly like the examples above, or you can mount your fixture directly to the wall. 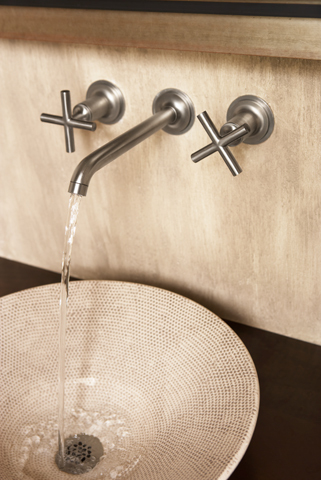 These types of fixtures offer a free falling water effect and are an elegant alternative to traditional faucets. 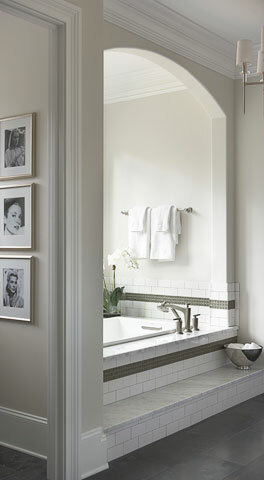 A wall-mount design also offers a clutter-free countertop in your bathroom. In addition to all your bathrooms, a faucet must be selected for your kitchen. There are a multitude of options and styles. There are faucets with two handles, mixing hot and cold, or faucets with one handle that rotate directionally. Each style has its own benefits, but the decision is mainly a personal preference. Most kitchen faucets also use a cartridge, ball or ceramic disc valves. 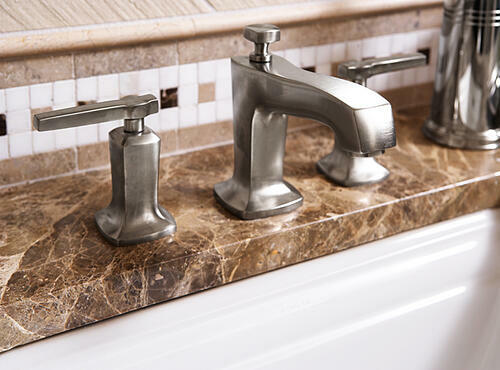 Choosing a faucet with a ceramic disc will be the most durable option. You also have to decide what kind of sprayer you want with your kitchen faucet. Some models integrate the sprayer into the actual faucet itself, while others are separate. Again, the decision is mainly a personal one. Stand-alone tubs also offer a variety of tub filler fixture options. 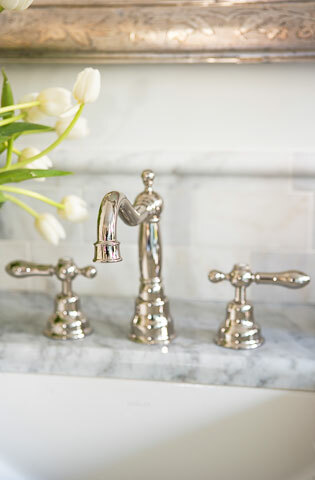 Whether you like ornate or a more simple and classic design, there are various styles and finishes available to fit in with the rest of your plumbing fixtures. There are also different ways to mount your tub filler. One option is to mount it directly to the tub. The other option is to directly mount it to the wall. 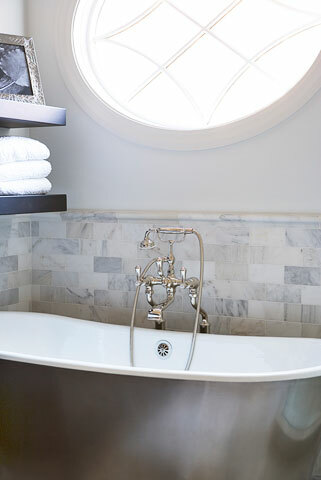 Placement choice will depend on the location of the tub in your bathroom as well as tub shape. 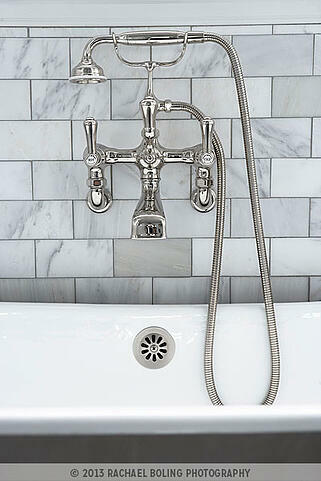 When it comes to bath fixtures, stand-alone tubs aren't the only option. There are some beautiful garden tubs available that can be paired with a variety of plumbing fixtures. If you are in the process of selecting plumbing fixtures for your home, download these additional tips to help you make the right selections. If you love the look of this graceful master bathroom and the elegant plumbing fixtures that accompany it, learn how you can get the look yourself in our designers' corner of our online boutique.